Heading into the first night, we were scheduled for the early seating at Posh Restaurant. 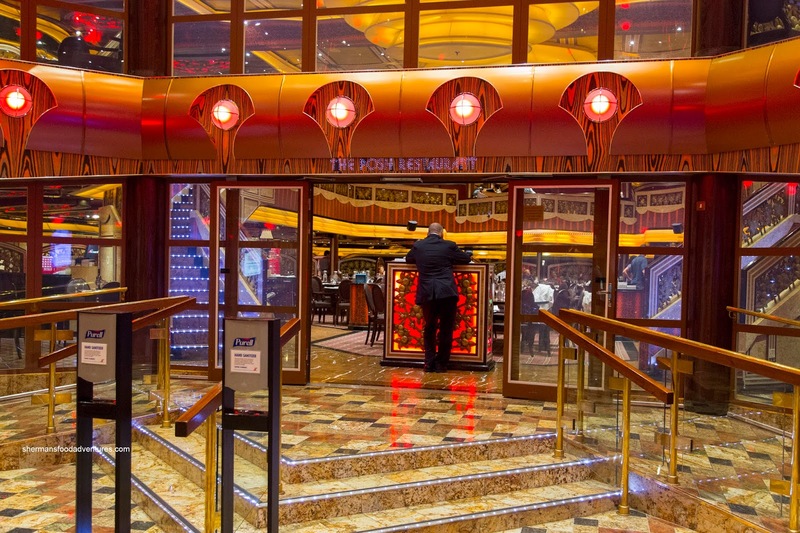 This is one of 2 main dining rooms aboard the Freedom with Chic being the other main dining room (but for "Your Way Dining"). Unlike any other cruise ship we have been on, we were assigned booth seating which was rather private for the 4 of us and comfortable at the same time. We were greeted warmly by our waiter, Iradwin and his 2 assistants, Gede and Gefri. We found them efficient, attentive and responsive to our requests. For our appetizers, I started with the Maryland Corn Chowder with potatoes, peppers, oregano and cream. This was served smoking hot and chock full of sweet corn niblets and tender potato nuggets. 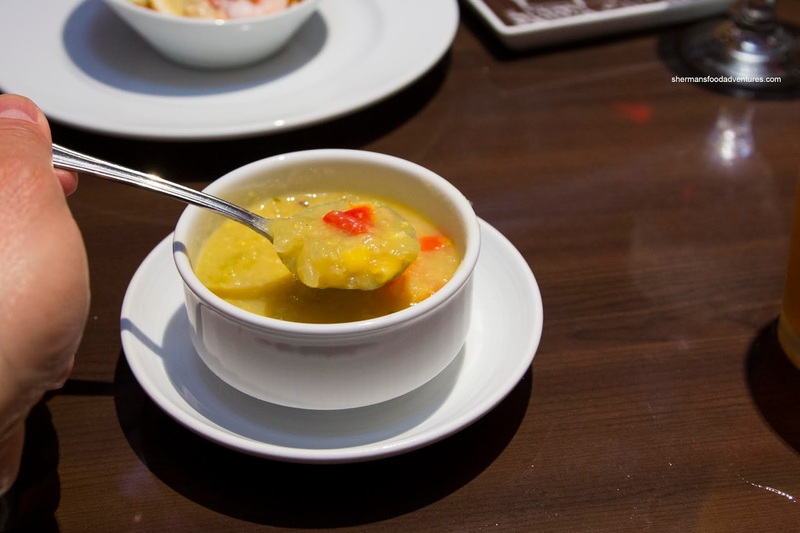 I found this to be more similar to a thicker cream of corn (Asian-style) rather than a chowder. 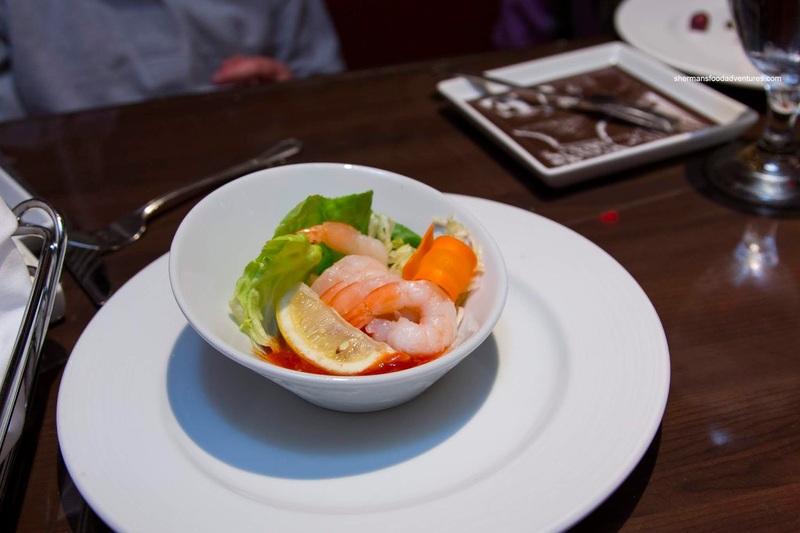 This was not a bad thing though as the soup was lighter and didn't take away our appetite. 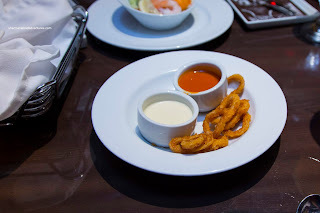 Viv went for the Fried Calamari which was served with 2 dips - zesty tomato and lemon aioli. Although this didn't look like much (weak plating), the squid rings were tender with a chew while coated in a light breading which was crispy. I enjoyed the lemon aioli as it was tangy and light while the zesty tomato came exactly as advertised with a kick. 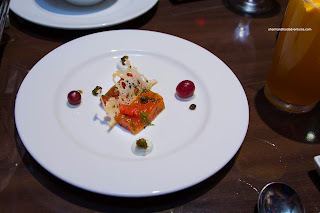 My daughter had the Cured Salmon with candied tomato, dill cream, grapes and lemon dressing. Since it was sugar cured, the salmon was firmer and chewier. Again, this was not a negative, rather we had to point that out to her as she was expecting smoked salmon texture. It was mildly sweet with an equal amount of saltiness. We thought the dill cream added another layer of flavor while the tomato offered up the necessary tang as well as more sweetness. My son had the classic Shrimp Cocktail with traditional cocktail sauce. This was pretty straightforward with buttery shrimp that had a cold water snap. I found the cocktail sauce to have enough horseradish for impact. 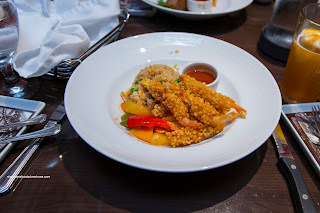 Viv ordered the Fried Shrimp accompanied by a tangy sweet and sour sauce and a scallion garlic & shrimp fried rice. 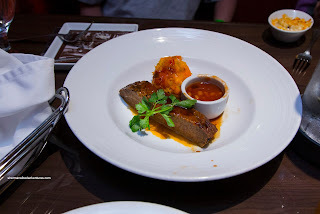 At first, I was skeptical of the dish as we had something similar on Holland America and it was not very good. This dish, on the other hand, was better since they served the sauce on the side. As a result, the crispy rice coated shrimp were crunchy and light while not soaked in sauce. The best part was actually the fried rice as it was nutty and well-seasoned with chewy grains. 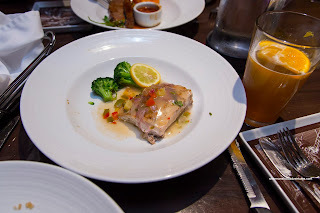 For my daughter, she had the Grilled Mahi Mahi with coconut, fresh pineapple and red pepper sauce. Unfortunately, the fish was a bit overdone, so it turned out to be dry. Despite this, the sauce was a nice compliment as it was tropical with aromatics and bright flavors. My son wasn't sick of brisket and decided on the Barbecued Beef Brisket with baked beans and double baked yams. Although we've had our fair share of authentic smoked central Texas brisket during the week, this one was actually respectable. It was super tender and moist while lightly smoky. Sure, it wouldn't beat some of the competition-level BBQ in Texas, but it was delicious nonetheless. The ball of yams and peppers on the side were good except the peppers didn't seem to go. 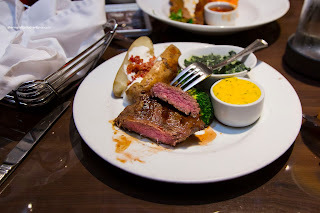 For myself, I had one of the standard (offered every meal) dishes on the menu being the Flat-Iron Steak with Bearnaise, baked potato, broccoli and a side of creamed spinach. I'll admit that I was surprised to see that my steak was cooked a perfect medium-rare. It was tender, juicy and nicely seasoned. The creamed spinach was also good where it wasn't cooked to a pulp. 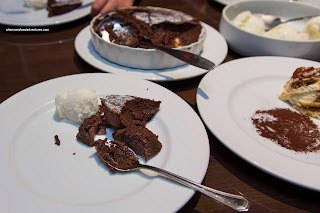 For dessert, we shared their famous Carnival Melting Chocolate Cake for the table. This large serving was enough for 6 people, let alone 2 adults and 2 kids. There was a crispy crust on the top and sides while the middle was soft, moist and indeed melting. Exhibiting plenty of chocolate flavor, the cake wasn't incredibly sweet. 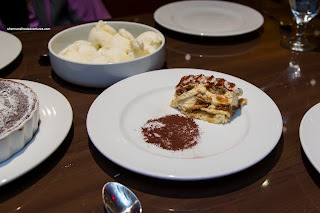 Served on the side was a bevy of vanilla ice cream to eat with the cake. We also added the Tiramisu for good measure and it was also pretty good. It sported soft, well-soaked lady fingers and creamy marscapone. The dessert ate rather sweet and needed just a touch more espresso. 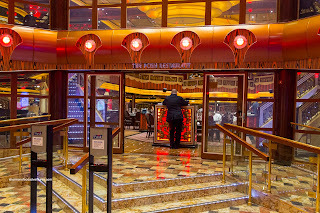 For our first ever sit-down meal on a Carnival cruise ship, this was much better than we expected. Sure, the fish could've been better, but that is not unique to Carnival as it is a hard dish to nail when preparing so many of them. Good start to the cruise!